Featuring a 7/16 in. hex quick-change retention system for fast, secure insertion/removal of auger bits and socket adaptors, this tool is especially useful when drilling and bolting applications require frequent accessory changes. This is the only variable speed impact wrench of its kind available. It has a Milwaukee built motor coupled with a large ram and anvil which produce up to 315 ft. lbs. of torque! 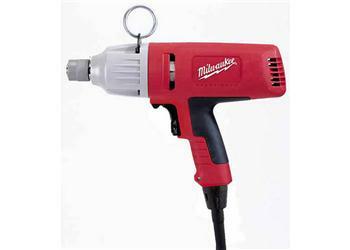 This impact wrench can achieve tasks only larger impact wrenches could do in the past. Fastening applications, driving large lag bolts deep into wood, and drilling large holes in utility poles can easily be accomplished with the 9092 impact wrench. The tool also features an all-metal front housing to withstand rough job-site abuse. Besides its durability, the tool is also very comfortable to use. A mid-positioned handle provides better balance. The cushioned grip area, variable speed switch, and easy-to-use forward/reverse lever make many tough jobs seem effortless. The bracket and ring which are included make hoisting with a rope or carrying on a belt much easier. Also included is the exclusive Milwaukee QUIK-LOK® cord system, for fast, easy cord replacement. High torque - 315 ft. lbs.